Bora Bora looks and sounds just like paradise, and so it is no wonder that it is so popular with honeymooners or those just looking for a romantic, luxury getaway! If simply looking at photographs is not enough of a reason for you, here are five other reasons to visit Bora Bora. The lagoon is what dreams of made of, with stunning turquoise water which looks out onto Mount Otemanu. The beach full of golden sand and the palm trees are plentiful – it’s such a colorful scene that you’ll feel like you’re dreaming with the contrast turned up! Every morning you will wake up to the unbelievable view and start your day in paradise. The water is stunning from the land, but it’s even more incredible when you get up close and personal with the residents! Snorkeling or scuba diving in the waters will open up a whole other world, full of stingrays, manta rays, reef sharks, and beautifully colored tropical fish. Book a guide to show you the best places to spot these creatures and create some unforgettable memories. With the weather being quite balmy, you will welcome the coolness of the water, and a lot of it is very shallow (although the deeper areas give a different shade of blue which is just beautiful), so ideal for a paddle to cool down! 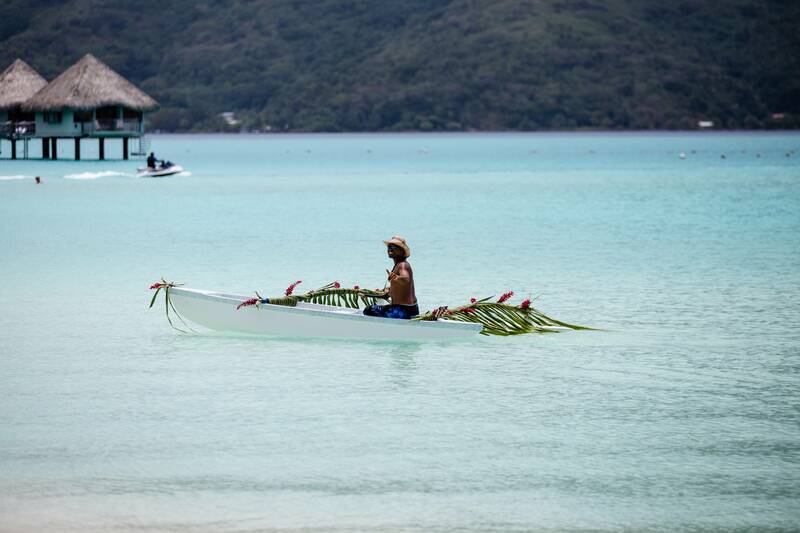 One of the most appealing things about Bora Bora is that it’s never crowded with tourists. In fact, the whole French Polynesia gets the same amount of visitors that Hawaii sees in a week, over the course of the entire year! That means you can really relax without hoards of other people, and the beach really does feel like a secluded paradise, even in the peak season. 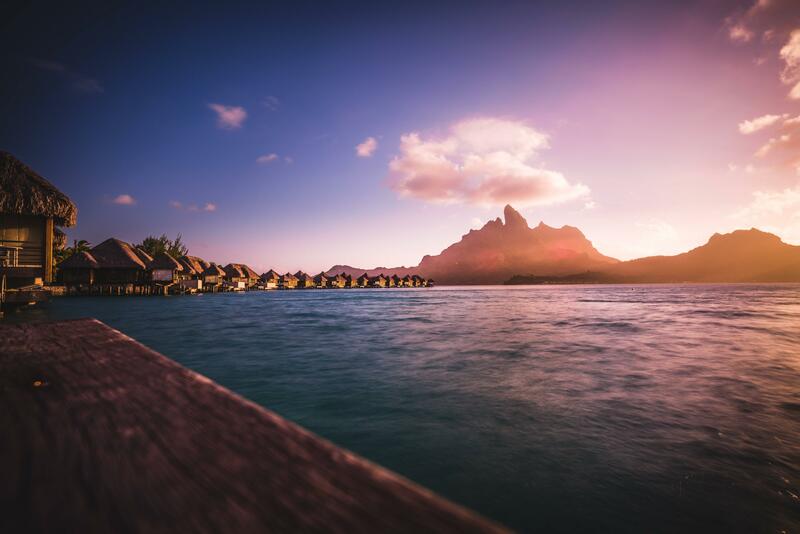 You won’t be slumming it in Bora Bora; it’s all about the luxury experience. Staying right on the beach is incredible of course, but the most iconic accommodation choice is a private overwater bungalow – there’s a reason that these are the photos all the brochures show. You’ll be immersed in the beauty of this stunning island from the moment you look out your window every morning. A lot of the interior design of the accommodations blends Polynesian culture with contemporary touches for a perfect balance. You won’t want to go home! Due to the lack of tourists, the area is unspoiled and pure. No vast high rise hotels are blocking the view, and everything is set up for relaxation and an amazing experience. There is an abundance of spas offering exquisite treatments, and you can enjoy mouthwatering French delicacies while watching the sunset over the water. There are no hotels offering tacky entertainment, but it is still family friendly. So, if you’ve never considered Bora Bora as a potential travel destination, perhaps this post has changed your mind! If it was your other half who needed persuading, perhaps leave this tab open on their computer… We are sure it won’t take much to convince them at all.